I could not find a cause for the conflicting results between filling the list and checking the migration results so I eliminated the difference — the exact same SQL now runs instead of 2 variations based on parameters. The failed migration message should now show the records that failed to migrate. It's hard to test that bit when I can't reproduce the failure so let's hope it gives us enough to work with. I experienced that same problem when I tried to run the upgrade. In the error message it is reporting a date of "03/10/49" Since that is before the earliest date as defined within xtuple it is where the problem is. My issue was in the vouchering tables where incorrect manual date entries were being added into the database. How did you identify which transactions (in which tables) had offending dates? I don't know whether to necessarily look through AP, AR, GL, inventory, etc. etc. etc. Gil sent me the following query. I ran it using a database tool and found about 8 entries with bad dates. 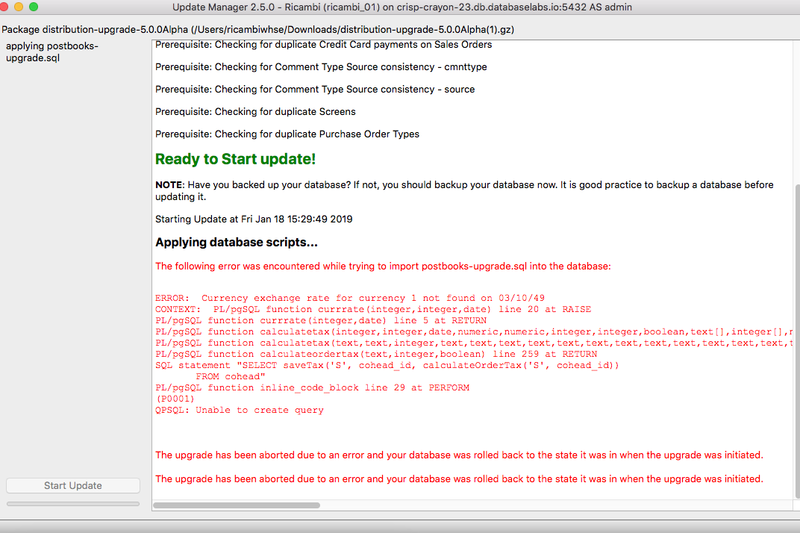 I did an sql update of the bad records and then it worked. Here is the query. The results should be 0 rows. However I think you'll find some records. I think I'm butting up against a wall here. I ran that query on the voucher file, didn't find anything. There are simply too many tables for me to go browsing around looking for date problems. An error log or something from the conversion program would instantly tell me where to look/fix historical stuff --- but without it, I'm somewhat dead in the water. Hey Daniel, this is an alpha release, and there are lot of fixes going into beta. That being said, how large is you DB? can you dropbox me a copy? I had connection info on yours several years ago but I cannot locate it, if you want to email me directly, I can test yours when I retest some of my other databases. That way I could give you heads up on the beta and issues I can find. Absolutely --- and yeah, I know its beta/alpha stuff. We're testing it on a totally different hardware stack, just kinda getting our "ducks in a row" for 2019 We have some pretty serious ancillary stuff realtime connected to the xTuple database, and if there are big changes to the table structures in XT5, we want to be ready. I can work with either one, if it's beefy, I will look at were it's beefy. Here's a utility script to look for records that might encounter upgrade problems. It looks at more columns than might cause upgrade issues but it's a start. A comment at the top how the script was generated, followed by the queries themselves. Look for results with non-0 counts. This is not intended to be an end-user solution, just a tool for power users to look for problems. 63 sales orders were packed well before xTuple was founded, ranging in time from year 100 to 1909. These won't cause upgrade failures but posted dates and order dates might.